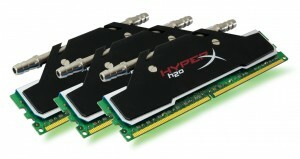 Fountain Valley, CA — August 2, 2010 — Kingston Technology Company, Inc., the independent world leader in memory products, today announced the release of HyperX® ‘H2O’ water-cooled DDR3 dual- and triple-channel memory kits. With frequencies up to 2133 MHz and capacities up to 6GB, H2O is the newest addition to the HyperX product family and supports the needs of enthusiasts building with water-cooled systems. 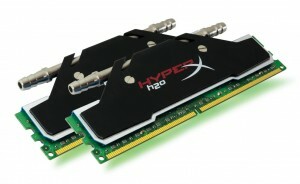 Kingston is debuting three HyperX DDR3 products in the new H2O line: two 4GB dual-channel kits (2000MHz, 2133MHz) and a 6GB triple-channel kit running at 2000MHz. H20 is available through Kingston’s channel of authorized distributors, resellers, e-tailers and retailers. Here is the product page on Kingston’s site. Of course, no press release would be complete without a bit of eye candy to whet your appetite! What is the metal used in these pipes? Kingston said they would have to check and get back with me on that. It looks like nickel coated something or other just looking at the photos. I fear aluminum but would be very happy if that were incorrect. If you’re interested in this answer, stay tuned to the thread accompanying this article and I’ll post the info as soon as it is received. What is the inner and outer diameter of the tubing? They were quick with the answer on that one – it’s contained in the data sheet. Unfortunately for most water coolers these days, the answer is 8.0 mm OD / 6.0 mm ID, meaning it’s made for 1/4″ ID hose. While that’s not exciting to a lot of folks, it’s no worse than OCZ’s already-on-the-market water cooled FLEX series, which also sport the same dimensions. On the plus side, it’s a straight tube with the heat transfer accomplished via the heat spreaders. So, unlike the FLEX series (which has two 90° turns), the water in these goes straight through – helping with flow through an already restrictive tubing size. Last, but not least – how does it perform? Kingston was kind enough to supply a couple thermal images showing the performance testing of their initial engineering samples. Without water flowing, the heat spreaders kept the RAM around 50° C and with it flowing, the RAM stayed around a cool 40-42° C. Almost a ten degree difference is quite impressive! How beneficial this is really depends on how you plan to use the RAM. For 24/7 use, Intel has strongly advised we not go over 1.65 V, so the kit can do two things for you – run cooler, presumably increasing longevity and run quieter, negating any need for a fan to cool your RAM. Quiet running is one of the great benefits to water cooling and if that’s your goal, these may help in that regard. For suicide runs and more extreme clocking, as I said – almost ten degrees is a significant drop in temperatures. For those runs where overclockers want to push more than the suggested voltage, this could end up being a very good thing assuming the sticks are up to the challenge. It’s no RAM LN2/DICE pot, but it’s definitely better than air. There you have it folks, new water-cooled RAM from Kingston. Whether putting 1/4″ ID tubing in your loop is worth it is up to you! Heard about these today from a friend, they look cool and all but they should consider selling the WC blocks separately as well. Looks aluminum to me...if they didn't know right off the bat I don't feel like they did their research enough to know that the watercooling community shuns aluminum...maybe the right person wasn't asked or something, but a lot of companies (ie:gigabyte) make that folly on their first watercooled product...the fact that they used 1/4" barbs points to a similar conclusion...nice try...decent design on keeping restriction down, but I don't see this being a success. I'm not going to say the test skews anything, but realistically how many people are going to run their memory with it's own pump/reservoir/radiator? And not just have it as a loop running with the cpu or graphics card? Frankly for the intended use I'd rather see a low powered TEC setup for each individual dimm (air cooled or water would be fine). Why doesn't Kingston just quit using bad memory chips? They have the exact same speed and timing of other HyperX kits. I would think if they took the effort to water cool ram they could improve either speeds, timing or even lower voltage needed to run ram at rated speeds.